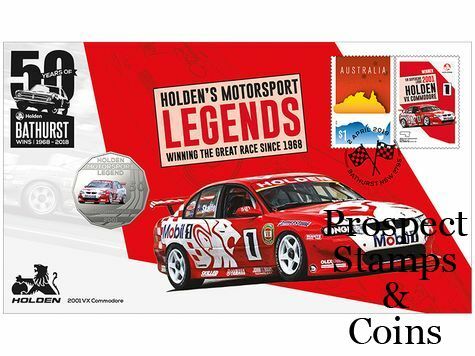 The Holden 2001 VX Commodore postal numismatic cover is highly collectable, featuring a pictorial envelope with a Holden 2001 VX Commodore tab and the Australian Map stamp along with a coin from the Royal Australian Mint. Holden’s 2001 VX Commodore, known as chassis HRT 045, was so loved by its driver Mark Skaife that it was nicknamed “The Golden Child”. And there was a lot to love about this supercar, including an impressive steering wheel-mounted dash display. The Golden Child propelled Mark Skaife to 20 championship race wins, including back-to-back victories at Bathurst and the Australian Touring Car Championship in 2001 and 2002.